A Jackson, Mississippi native, Angela Thomas, participated in a video conference session with Literary students at Mississippi School of the Arts. Angie is the author of the #1 New York Times Best Seller “The Hate U Give,” which was the inspiration for the movie also entitled “The Hate U Give.” According to Thomas, she was an executive producer of the cinematic production. Students asked questions during the 30-minute connection, where they gained knowledge of thoughts and ideas for the best-selling book and movie, including some tips on how to get published as a writer. “I was very involved,” she said when asked about her role in the movie. “I got to tell my opinions quite a bit, but the studio ultimately made all the decisions. But I was consulted a lot from the screenwriting process to while they were filming. I even had conversations with the actors about their characters so they could get a better understanding. They filmed the movie for 6 weeks and I was there for 4 of them,” said Thomas. Students gained a better understanding about their potential career choices in literary arts, but Thomas stressed the importance of telling the story your own way. According to Thomas, her college experience helped her take constructive criticism and ideas, but everyone is human. As a student at Belhaven University, Thomas was exposed to career opportunities as a creative writer and taught to think outside of the traditional art world and to know she wasn’t limited to just being an author. “You know, it was scary majoring in something like creative writing, but what I came to learn is that the artform of writing is, honestly, such a skillset that can be used in a number of ways and number of industries. The government hires writers to work on their web sites. There’s so many different industries that uses writers in so many different ways. With a creative writing degree, you can become an editor, or you can become a literary agent, or even a writer for different web sites and social media. Companies are now hiring social media managers and guess what? They need great writing skills,” said Thomas. Visit the web site of Angie Thomas as http://www.angiethomas.com. 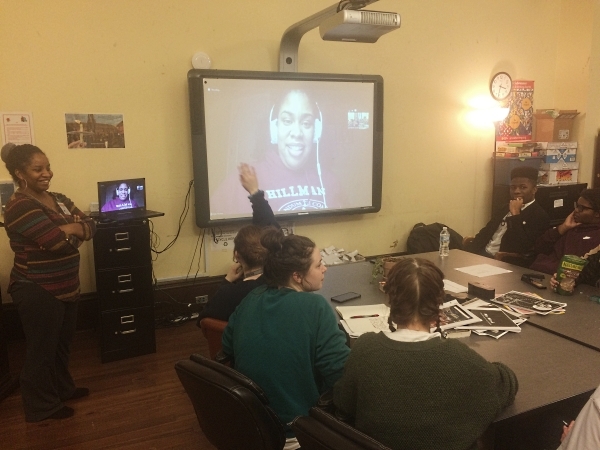 The video conference session with author Angie Thomas was an event sponsored by the Guest Artist Residency Program, inviting practicing artists from all over the nation to interact with students at Mississippi School of the Arts.